Hercules mainframe IBM emulator running MVS 3.8, with a TSO terminal session. Honestly, haven't taken a serious look at anything QT, like your screenies and might have to do just that! Used Lxde before switching to Xfce and did think Lxde was a great DE, very fast and lean. Will have to explore LxQT and see what is happening! Many Thanks! Used Lxde before switching to Xfce and did think Lxde was a great DE, very fast and lean. Will have to explore LxQT and see what is happening! I had bounced back and forth between LXDE and XFCE for years, then at some point LXDE became frozen in time; so XFCE has been desktop of choice ever since. Recently, I had noticed I was having trouble interfacing with GTK based apps; mainly with scrolling. I seem to be always fighting the interface to get done what I need to do. Frustration set in, so decided to give an old friend LXDE, now LXQT at try. I find QT interface more intuitive and clean, for me at least. Give it try! ^ I second this. LXQt team is doing a great job, I highly recommend it. I find QT interface more intuitive and clean, for me at least. Give it try! Same history with Lxde, Xfce for a very short period and over to CrunchBang! Thanks, like to keep up with changes and see how things are with other DE's, basically a Wm person but need to know about dependencies too! 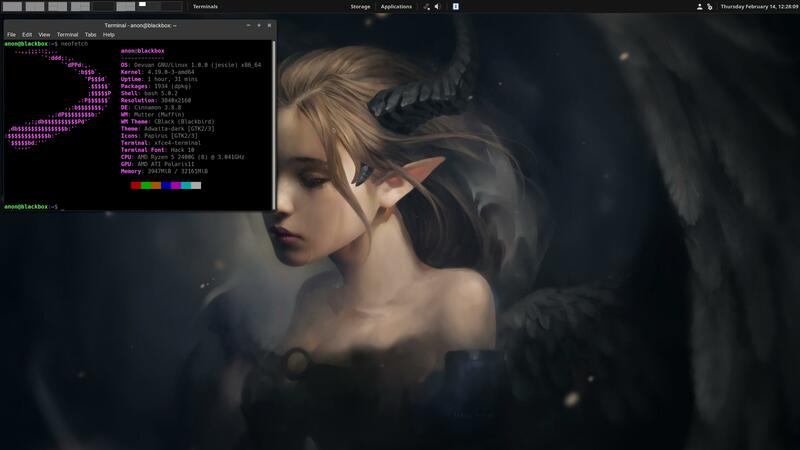 ^ and if you like really flashy kde style themes you can use kvantum through lxqt, i tried it but didnt like it. Thanks for the info, not a KDE fan although think the original versions I tried out were cool! Thanks for the tip! Refracta xfce4 with i3-gaps as the window manager. Devuan Ceres running Cinnamon desktop with 8 virtual desktops, each named and assigned a specific purpose. Browser, Communication, Work, Downloads, Finances, Music, Terminals, and Scratch. Next to the desktop thumbnails is a workspace selector by name. I rarely use it, but it's handy when I'm holding a cup of tea or coffee and don't want to use keyboard shortcuts. In the middle of the screen, commonly used storage locations, my application menu, hardware controls, and a system tray. To the far right, user settings, system settings, and calendar. I rarely use the user or system settings, but the calendar is handy. Heavily keyboard centric, with heavy use of quadrant snapping for window management. Quadrant snapping + tabs works better for me than tiling window managers, personally. I've used this setup for years, and it's really well suited to my workflow. I'm getting a little sick of the theme though, it could use some more polish. Now that I've made the move over from Debian and am refactoring my system setup scripts, I'll probably take the time to setup a proper rice using some of the minimal base16 palettes that grab my attention so often on /r/unixporn. Also pictured, neofetch's inability to detect Devuan Ceres properly. Possibly the file in /etc/os-release didn't change with upgrade. Upgrade CROWZ Ob today to Beowulf/Ceres and it does work as advertized! I'm really impressed with some of the desktops here. Normally there are some very dubious ones around but here, and especially on this page, there are some great additions. I really love the dark styles of the ones by imhigh.today and zephyr, fantastic choices and environments to work with. This Ultrabook has had something of a workout today but I think everything is now finished. All updates are done and I've backported Libreoffice to version 6. I'm happy to stay with the stable kernel. Everything seems to be working well now. And to think this machine was going to be destroyed at my workplace because it was Windows 8 and 'too old' - what a waste, it's probably the best laptop I've ever used. Normally after I install an OS for the first time I have a list of apps to monitor. I don't really have anything at the moment to watch, everything seems to be functioning well. My first shot of Devuan. Happy to have joined the world of systemd free. Thanks for the kind words. That's conky. @ Head_on_a_Stick: Greetings and welcome to the forum, great to see you here! Hello zephyr, great to see you too! My compliments to the devs. Nice!! But you still have the ASCII theming! The "bloody" beowulf theme parts are here. Screenshots too up top. The very helpful ToZ at the Xfce forum just gave me a snippet that fixed the final gtk-3 glitch in the Clearlooks-Phenix-Cinnabar theme. Give me a few to get that uploaded. No picture but a description. Windowmaker. Style "Golden". Background suitable image or just "wheat shades". 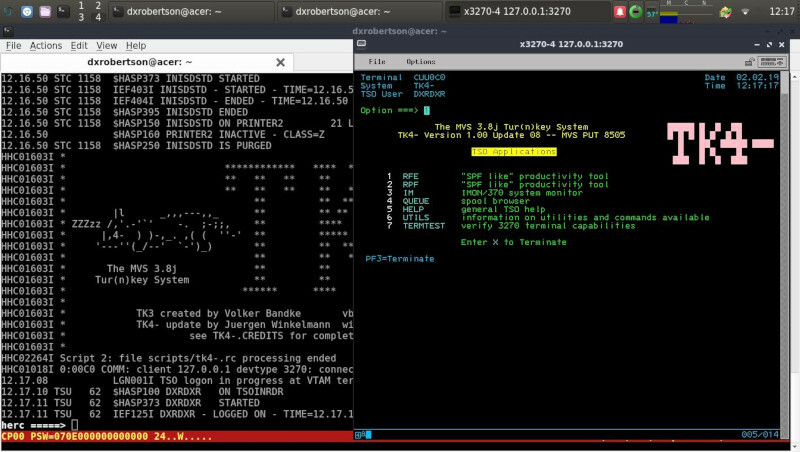 Terminal urxvt with X11 font color "gold", background a really dark gray. wmtime as the only dockapp, well on the notebook wmbattery, too. The "bloody" beowulf theme parts are here. I installed using debootstrap from my Debian buster system rather than the Devuan installer (I can't add any more partitions to my disk, I had to use a btrfs subvolume instead) so I don't have the standard Devuan desktop.